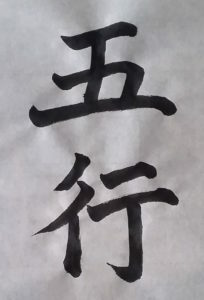 The five elements or 5 phases (Chinese: 五行 (Video Calligraphy Wu Xing), pinyin: wǔxíng, Wade-Giles: wu3 hsing2, pronunciation (soundfile) – wood, fire, earth, metal and water – are a structural concept of Chinese thought. Their interaction and mutual influence on each other are – apart from the Yin/Yang dualism – the central pattern of interpretation of Chinese philosophy. The Chinese characters for „five elements“ – are a combination of the numeral wu (five) and xing, which means to go, to walk, to travel, to circulate. The five „elements“ therefore are not static, they are constantly in movement. They describe certain patterns of action and behaviour. Alternative names, which express these connotations more clearly, are: the five processes, the five phases or even the five movements. The five Chinese elements (wood, fire, earth, metal, water) can thus be distinguished from the four elements of the classical theory of elements of ancient Greek (fire, water, earth, air), which are conceptualised in a physical, solid way. This mixture of natural science and philosophy by the ancient Greeks was the starting point for (medieval) alchemy as well as a precursor of Western chemistry as a modern science. Within the Asian region the Chinese five elements and their theory have to be distinguished from the Japanese respectively Tibetan version of the five elements, which works with different elements (fire, water, earth, wind/air, emptiness) and is rooted in Buddhism. In contrast, the Chinese five elements are based on daoist philosophy; their dynamics show a strong connection to the Yi Jing / I Ching (Classic of Changes). representation in a circle: Accentuating the dynamics and the process – cycles of nourishment and weakening/restraining (+/-) and cycles of creation and destruction (++/–) – this circular representation forms a connection to the Yin/Yang principle in which Yin features as „motherly“ creation and nourishment and Yang is represented as „fatherly“ restraining and destructing force. representation as a wheel with the element earth in the middle (as hub), while the other elements form a rectangular cross: Accentuating the natural context, this cosmological representation focuses on the axis heaven – earth – man. Both versions of representation can be unified if thought of as a 2D-projection of different angles of view at a pyramid: If one imagines the five elements as a pyramid with the element earth at the top, the bird’s view directly from above will result in a projection of the cosmological representation, while a diagonal view from above can be projected as circular representation. Theory of the five elements ascribes various symbolic meanings to the single elements, e.g. colours, seasons, flavours, moods etc. Leaning on the five elements, the classical Chinese philosophy thus explains a multitude of natural and social phenomena: the change of the seasons, cosmological and planetary correlations, but also the succession of the political systems of the Chinese empire. Analogies and references to the human body and its functions creates numerous fields of application for the five-element theory in Traditional Chinese Medicine (TCM), e.g. dietetics following the five elements, the techniques of tuina and the theory of the meridians. Even Feng Shui – the Chinese theory on (visual) harmony and design – derives from the dynamic of the five elements. Furthermore, the five elements are a central concept in the underlying movement theory of Qigong and the internal martial arts. One example in Qigong is Qigong of the five elements resp. Five Animal Qigong. In addition to that there are special exercises focusing on the inner organs (Organ Qigong) and breathing techniques (e.g. The Breathing Flower), which are also based on five-element theory. In martial arts, the five directions of Xingyiquan derivate from the five elements. There is even a Five Elements Form: Wu Xing Quan.